As an investor in the accumulation stage, I tend to focus on companies with yields of at least 3% and expectations of future dividend growth. 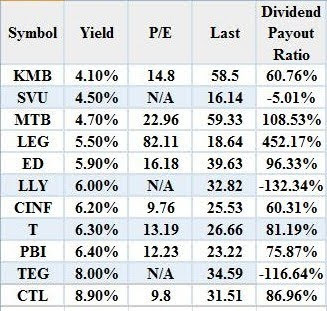 Most of these companies have a history of consistent annual dividend increases which exceeds ten years. I do receive constant criticism from readers however, that I profile very few stocks yielding 5%-6% or more; and then I do feature them I always express my negative opinion on the securities. I am not willing to accept an extremely high dividend payout ratio, which would have been acceptable for a utility or a Master Limited Partnership. I do realize that most investors want to generate enough income as possible from their nest eggs, which have been accumulated over the spans of several decades’ worth of hard work and sacrifice. The problem with this approach is that investors end up focusing on the end result, without giving much thought about the sustainability and growth of the dividend payment. In other words, although it would take for a 3% yielder 7 years to double your original dividend payment and yield on cost, when the dividend growth is 10%, I believe that investors are better off in a sustainable lower yielder, than in an unsustainable high yielder. The company yielding 6% today that cuts its distributions a few months down the road could end up generating far less income than what you expected. Some investors also disagree with me that stocks which are yielding 3% – 4% would barely produce enough income to keep up with inflation. The problem with this assumption is that in its goal of chasing the highest yielding stocks, you could end up losing from inflation. For example if you held all of your money in a group of stocks, yielding 8%-10%, and spending all the dividend income produced by your positions, you would lose purchasing power over time. Even worse – if the dividend payment is unsustainable, your yield on cost could even become lower than the current yield on S&P 500, if the company decides to cut distributions. Consider for example Bank of America (BAC), which at the beginning of 2008 would have yielded a cool 6.20%. Fast forward one year later, and the company is currently yielding 0.20%. The worst part is that the yield on your original investment in BAC is now 0.10%. Compare this to Kimberly-Clark (KMB), which yielded about 3% at the beginning of 2008 but which has raised distributions twice, for a total dividend growth of 13.21%. Your yield on cost is almost 3.5% now, and that is without taking into effect any dividend reinvestment. A common issue among high yielders is that they have a high dividend payout ratio. This means that the company is paying most of its earnings out as dividends, and doesn’t leave much for reinvestment in the business. If you add in stagnant earnings per share growth, and you basically have a disaster in the making. If that company all of a sudden decides that it needs cash for anything like merger or acquisition or if its earnings drop due to an economic contraction, chances are very high that the dividend payment, which was unsustainable in the first place, would be the first on the management’s chopping block. Consider Pfizer (PFE) for example. The company spotted a very high payout ratio both in 2007 and 2008. Investors who purchased the stock hoping that this cash rich drug giant would pay a 6%-7% were terribly disappointed when on January 26th Pfizer cut its dividend. The move helped the company save billions, which were much necessary for its acquisition of Wyeth (WYE). I do realize however that dividend growth is not guaranteed as well. But then I have a requirement of an initial minimum yield of 3% as a margin of safety in case this happens. Chances of a dividend cut are much larger for a company with a current yield of 6%, than for a company yielding 3%. The market is efficient in this section, so you have to understand what risk the high yielders represent, before leaping into the unknown. Just for the sake of comparison, I identified the components of the dividend aristocrat’s index, which currently yield more than 4%. Of the eleven companies presented, only Kimberly-Clark (KMB) and Cincinnati Financial (CINF) had what somewhat sustainable dividend payouts.